The Golden Retriever is most widely known for its loyalty and obedience to its family as well as family friends. It loves running and playing in fields, more specifically, having space to run around. If this dog breed does not get adequate “play time” and is under stimulated physically, it tends to develop behavioral problems. This is why a Golden Retriever must have physical and mental exercise every single day. This will help avoid any type of behavioral problems. When playing, the Golden Retriever can be overly exuberant but it is eager to please its owner and its family and it loves to learn new tricks and commands. If a Golden Retriever is well-trained and exercised on a regular basis, then it will be extremely well behaved and obedient. It is most famous for enjoying games like “fetch” that involve somebody throwing an item and the Golden Retriever catching it in mid-air, or if not caught in mid-air, finding the item to bring it back to its owner in its mouth. The upkeep of Golden Retrievers isn’t hard to do as long as you are aware of its physical and mental needs. It needs exercise every single day and if it does not get this exertion, then it can become disruptive. It also requires adequate amounts of interaction with humans. Obedience lessons, active physical games, or retrieving games are all great and preferred ways to exercise the Golden Retriever. It could survive outdoors but it thrives when it shares a home with its family and only occasionally is outdoors. The coat of the Golden Retriever requires brushing about 2 to 3 times weekly. The major health concerns surrounding the Golden Retriever include Chronic Hip Dysplasia, skin irritation problems, hemangiosarcoma, and lymphoma. Minor concerns include SAS, elbow Dysplasia, eye disorders (including entropion and CPRA), seizures, hypothyroidism, and possible mast cell tumors. Osteosarcoma is also occasionally seen in the breed. To keep your Golden Retriever healthy, it is important to get hip, elbow, eye, cardiac, and thyroid tests done on the regular. If kept healthy, it can live anywhere from 10 to 13 years of age. The Golden Retriever is said to be one of the most famously documented attempts to produce a breed that has been documented to this day. Lord Tweedmouth, just South of Scotland, is the man mainly responsible for the emergence of Golden Retrievers. He had a huge interest in retrieving dogs in the mid 1800s and needed something to suit his needs. He wants a dog that could push through heavy brush and vegetation, withstand chilled water, that was a strong swimmer, and retrieve game gently. He initially bred a wavy-coated retriever and a tweed water spaniel which produced a litter of four puppies. Crosses were also down with black retrievers, tweed spaniels, setters, and bloodhounds. 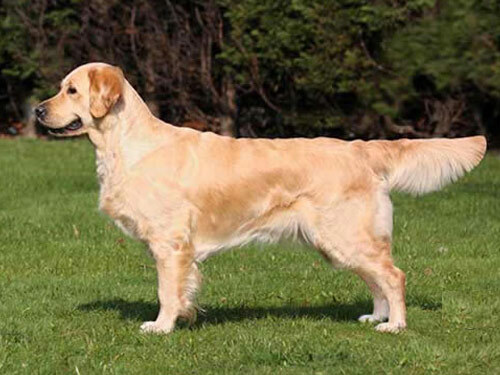 The Golden Retriever was initially coined the “Flat-Coated Retriever” but in 1912, it was recognized as a “Yellow” or “Golden Retriever.” The breed then made its way to America in the 1900s and was recognized by the AKC as a breed in 1927.